What type of cloth diapers should I use? At one point I had an article on different types of cloth diapers, but I can't find it! 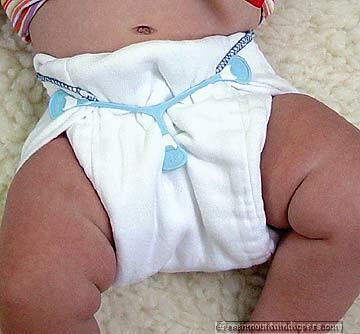 I've recently had a friend who is asking about the types of diapers out there, and what I think that she should sew for her new grandbaby. This is the perfect, short but sweet, list of what you want to know about the new cloth diaper systems available today. There are many more options available, such as wool, but I do not discuss that here. These are the basics. Decide where the diapering is going to be taking place. If you are going to be taking your baby into a day care, or if you are on the go all the time, cloth diapering is still an option. If you are home with the baby most of the time, you can try out a myriad of different products to see what you like the most, before committing to an entire stash of one type of diaper. Consider your cost. Diapering babies is expensive. Disposable diapers are an incredible expense. A few years ago, I did a cost comparison article between disposable diapers and one size, pocket, cloth diapers. Prices may have changed some since it was written, but it is still a very good comparison. 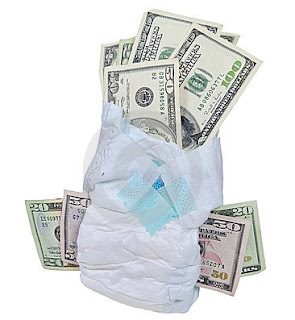 You can see the article on disposable vs cloth diapering costs here. *I have learned and discovered even better cost options for cloth diapers since this article was written. I'll be discussing that below. Consider your options of cloth diaper types. 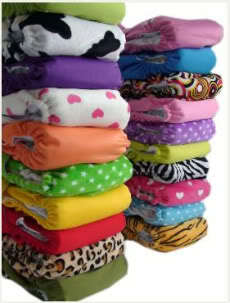 There are many, MANY types of cloth diapers available. All of those types have options as well. I'll be discussing the main types as well as my favorites here. You can sew your own with many different cloth diaper patterns, but before you buy, know what you want! This is what most cloth diaper users gravitate toward when they are starting to cloth diaper their babies. An all in one diaper is literally, "all in one". The diaper is sized similarly to the sizes of disposables, it's either velcro or snaps, and it has the 'soaker' built right in. There is usually a soft, fabric against the baby's skin which pulls moisture away from the body. There is a waterproof cover built right in. There is elastic in the legs, with or without gussets. There may or may not be a place to insert MORE 'soakers' inside the diaper itself. 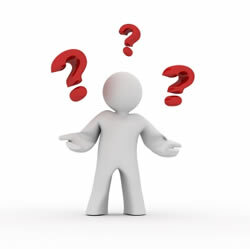 AIO diaper is typically the more expensive option because of how many diapers that the user needs. Because everything is built in, there is not the option to re-use the cover. This diaper is washed after every use. The sizes of the diaper range from 3-6, depending on the brand, and you'll need about 20-24 diapers per size. This is time consuming to make yourself, and expensive no matter which way you slice it. There is less adjust-ability for adding/removing soaker fabric for nap times or awake times. They feel like a disposable diapers to people who are new to cloth diapering. There is less room for error. The diapers fit great with each change, regardless of who is doing it. There isn't a need to 'educate' day care providers or husbands on how to use them, because they are easy, and straight forward. This is my favorite type of diaper system. An all in two is a diaper system in TWO parts. The soaking fabric and the cover. The soaking fabric can be elaborate, such as a diaper itself (also called a fitted), with wings and elastic and snaps, or it can be simple. A simple example would be a 'lay in' t-shirt, or prefold. The cover is usually wipeable to use for many diaper changes until it's soiled. You don't have to wash the cover with every change. It has a bit of a learning curve. You'll want to train caregivers or husband how to use them properly. The covers last longer (The fabric for the cover is the most expensive part of the diapering system), the elastic in the legs lasts longer, they are faster to make because instead of 24 diapers, you only need about 12-15 covers, they are significantly cheaper than other types of diaper systems. AI2's are usually fast drying since the insides come apart (which is cheaper in electricity and better for the diapers in general). These are my second favorite. 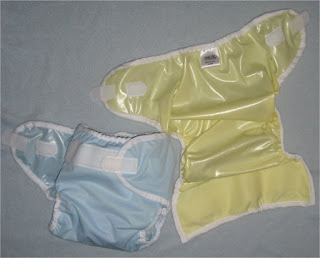 A pocket diaper is similar to an AIO, except the insert (soaker), is entirely removable. It usually needs to be removed before washing, but after washing, you stuff the soaker back into it and it becomes just like an AIO. 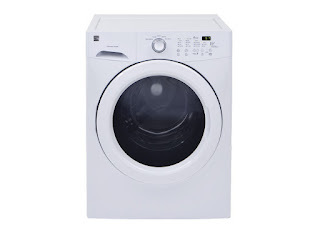 This is the better option to an actual AIO because they are better washing and faster drying. Its gross to remove the soaker from the diaper after use sometimes. 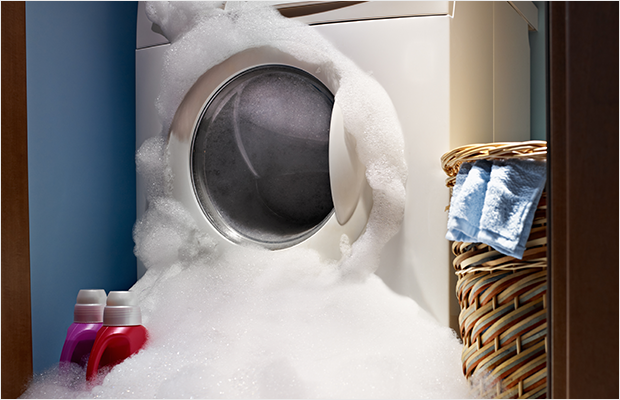 It takes a few extra minutes to stuff the soaker back into the pocket on washing day. You must change the entire diaper with each diaper change, which means that PUL (waterproof fabric), elastic, and velcro won't last as long. They are a great way to get the AIO functionality without sacrificing cleanliness. The soaker fabric can be made out of whatever you want, and if it's a folded soaker, it will open up, clean better, and dry faster. Consider your options of features in the cloth diaper that you want. One size diapers mean that they are 'one size fits all' from about 8 lbs to 32 lbs. 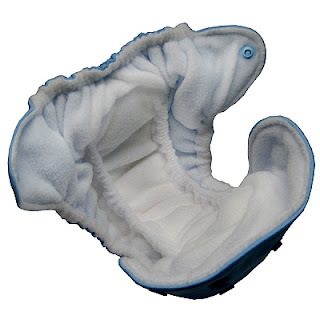 This is an excellent option for people who are using the AI2 or the pocket diapering system. 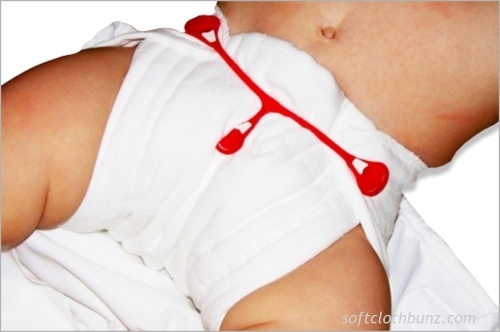 Typically there is a snap down rise, or adjustable, buttonhole elastic which allows the diapers to fit such a wide range. One size options are an excellent choice to keep costs and time spent sewing down to a minimum. I have a TWO SIZE diaper system pattern available on my website that is a two size AIO. This is an option for the person who wants the convenience of the AIO without the cost of so many sizes. Some diapers have FOE elastic, and some have hidden elastic. FOE stands for "fold over elastic" which is used on the edges of some diaper covers or diaper systems. It's usually quite soft and lasts quite a while. The FOE elastic usually goes around the entire diaper. 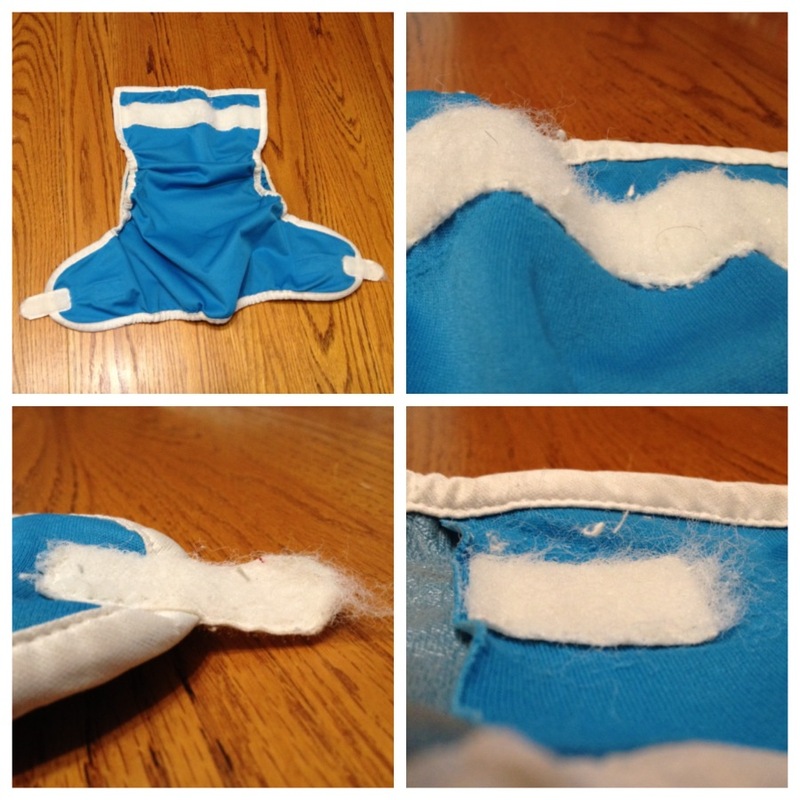 The hidden elastic option is when the elastic is hidden inside a casing in the legs and back of diaper. This is my preferred elastic method. This is the easiest to replace if the elastic gets worn out after multiple babies. I also find that FOE elastic gets pilled and snags easily in the washing machine if you have any velcro on your diaper stash at all. Foe around the entire diaper cover. This cover also has extra gussets. Snaps are my favorite hands down. Velcro is nice for the person who is on the fence about cloth diapering and wants a good way to keep the diapers as close to disposable as possible. The problem with velcro is that IT IS DISPOSABLE itself. After only a few washings, you will notice big time pilling in the velcro and that it needs to be replaced after only a short time. Plastic/resin snaps are incredible. They will outlast the diaper itself, they will look brand new until you stop using them. They are strong and toddlers can't remove them. Some diaper brands are big on making theirs seem like the best with multiple options such as hip snaps and snap in soakers, and other snap like functionality. Don't buy into it. A hip snap is a snap that one puts on your baby's hip of the diaper to keep the front wings from 'sagging'. Sagging only happens when a diaper doesn't fit properly, or if it's loaded down with contents that need changing. Snap in soakers seem good in theory, but it really is an unnecessary expense of time and bulk. This shows the hip snap on a cloth diaper. This is the boingo. 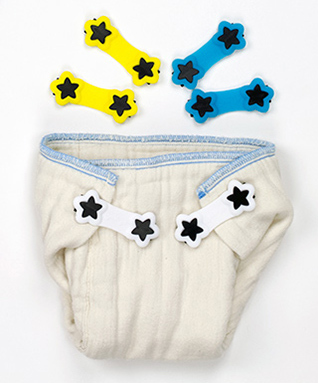 These are great for attaching to a prefold or flat diaper to hold in place around baby. If you own or think that you will own a front loading washing machine, there are some tips that are very very important to know when choosing cloth diaper options. Up until I owned a front loader, I didn't know that it was any different for cloth diapering. It IS. This is what I have learned. It's important to always remove soakers from pocket diapers. I never had to with my top loading machine. They agitated right out and got plenty clean before. 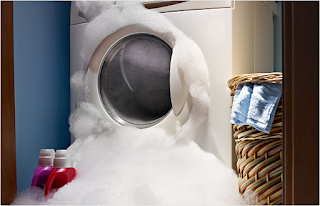 With a top loader, there is less water used, so the soakers don't agitate out. They usually form a ball inside the pocket diaper and don't get entirely clean. Oddly, you don't need very much detergent to clean cloth diapers in a front loader. I use about a tablespoon for an entire load, and sometimes I wonder if that's too much. I wash on hot/cold with the extra water function enabled. Then I do a repeat cycle WITHOUT soap to make sure it's all rinsed out. Every couple weeks, I will do ANOTHER repeat cycle to make sure that there are not suds in the diapers at all. If there are suds, I will repeat the 'soapless' cycle until the suds are non existent. I also find that I never have to use bleach anymore, nor do I want to. Because the soap is so hard to rinse out, the bleach is as well....which is very very very hard on the fabrics in the diaper. If you can manage to use a pocket instead of an AIO, do it. If you can use an AI2 instead of anything else, DO IT. If the soakers in the diaper can be folded into shape (like a prefold or tshirt) instead of serged together into a bulkier, more convenient shape, then go for the folded. The more 'removable' and 'open' your diaper can be, the quicker it will get clean, and the quicker it will dry. 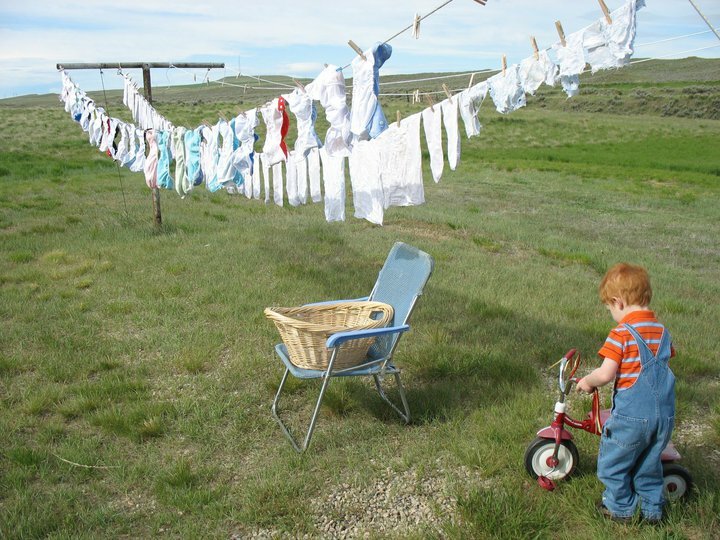 The more 'attached' and 'convenient' the diaper is, the more rinsing you will have to do on washing day. My very favorite diaper stash, for all the reasons that I wrote above, is the One Size AI2. I use a fitted diaper that is made from t-shirts, and I make it fast by simply using a snappi instead of adding snaps. I use a diaper cover that uses all snaps and no velcro. I also make them with hidden elastic instead of FOE. I never use hip snaps. I reach for these first! You may find that you hate this idea! It's totally ok if you have a different opinion! I've cloth diapered 5 babies before I finally decided on a favorite. Make a little bit of everything if you are unsure, and see what you reach for first, how they wash up, and what works for your family. It's kind of funny to say that my favorite is the AI2, because I actually don't have a written pattern for it yet. I am working on that later this month, so be watching! Do you have a favorite diaper stash? What are your reasons? If you've cloth diapered for a while, what are some pointers that you think others should know? MammaCanDoIt © 2017 . All Rights Reserved.